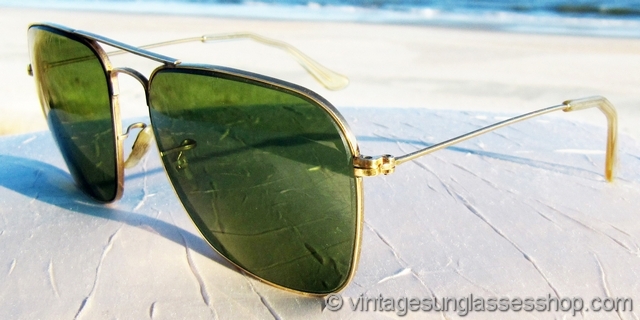 1 Vintage Ray-Ban 10k GF Caravan sunglasses are an icon of modern sunglasses design c 1950s - 1960s feature early Bausch & Lomb RB-3 mineral glass lenses and the 10k GF frame wherein 1/10 of the metal in the frame is 10k gold, all on the exterior plating of course. 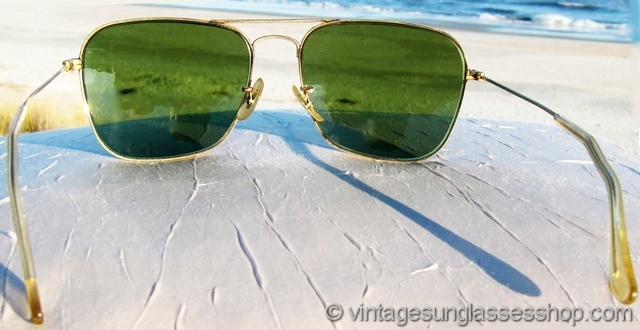 Ray-Ban Caravans have a unique lens shape that's instantly recognizable and looks great on a variety of face shapes, and the early Shade 3 lenses provide a great contrast with the gold plated frame. 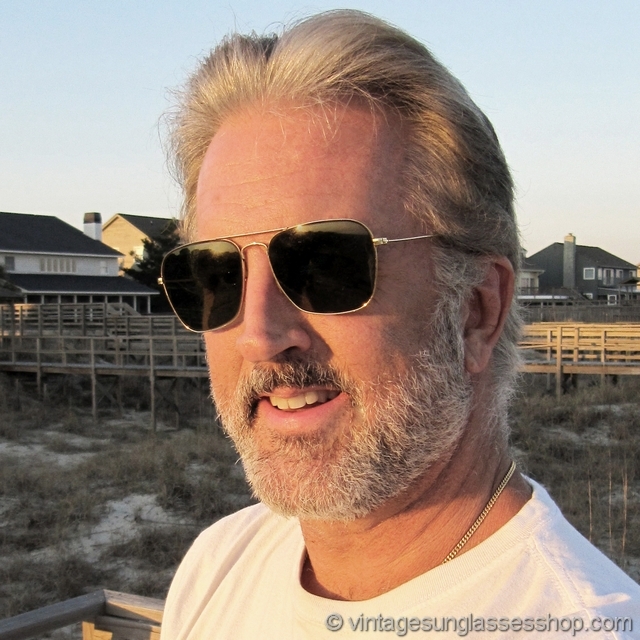 The unisex Ray-Ban 10k GF Caravan frame measures approximately 5.375" temple to temple with lenses which measure approximately 2.125" x 1.875" at the widest points. 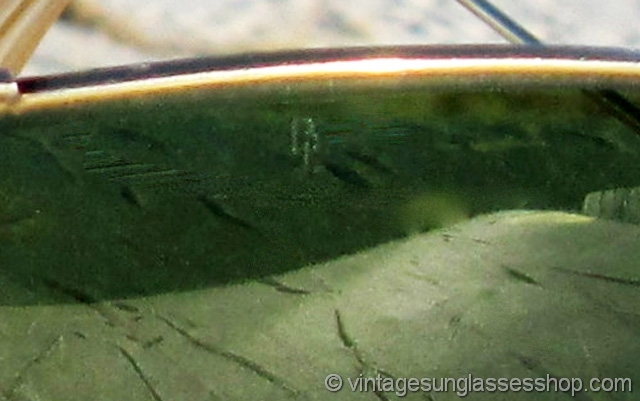 The top of the double nose bridge is impressed B&L Ray-Ban USA while the bottom of the bridge is impressed B&L 1/30 10k GF USA. 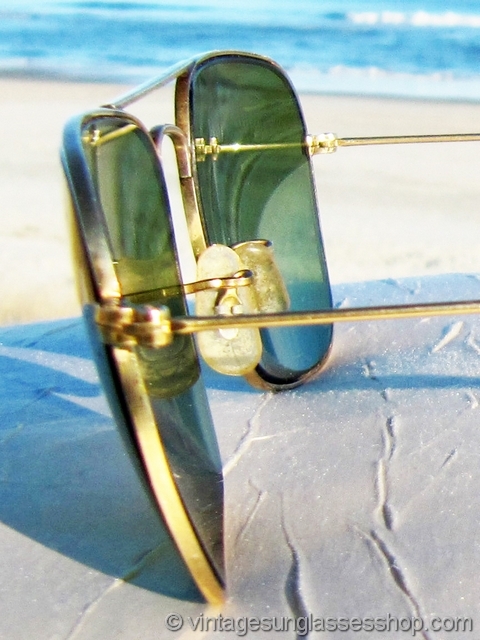 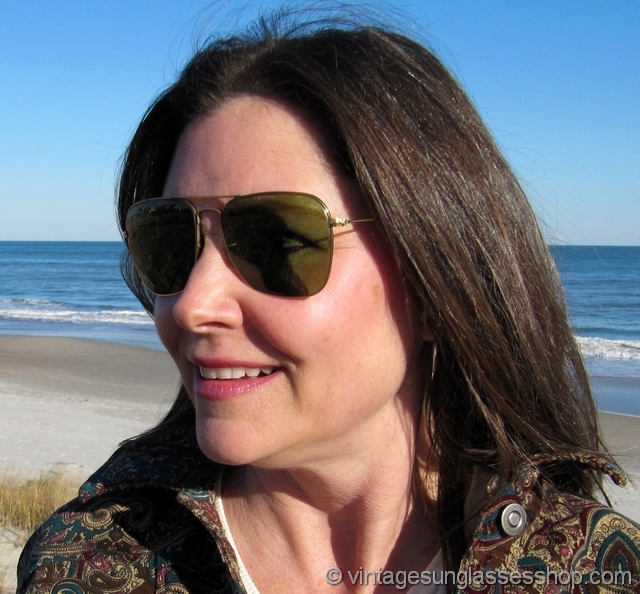 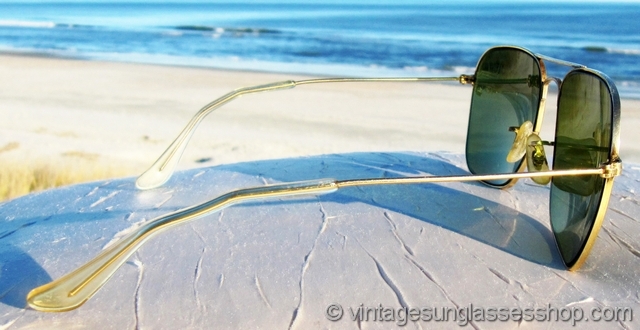 This beautiful old pair of Ray-Ban Caravan 10k gold filled sunglasses comes to you direct from a San Diego, CA estate collection of fine vintage jewelry and eyewear. 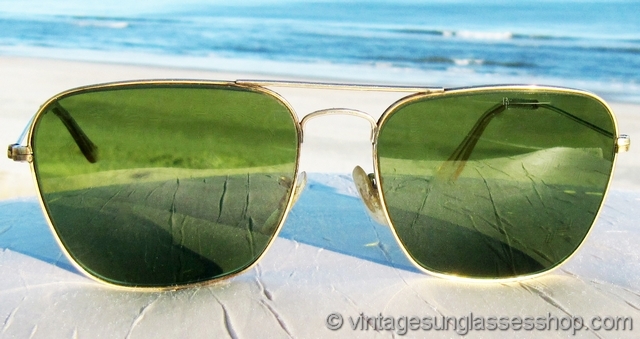 2 Identical in appearance but produced a few years c 1960s - 1970s, these 12k gold filled B&L Ray-Ban Caravan sunglasses are impressed on top of the nose bridge B&L Ray-Ban USA and impressed on the bottom of the bridge B&L 1/10 12k GF. 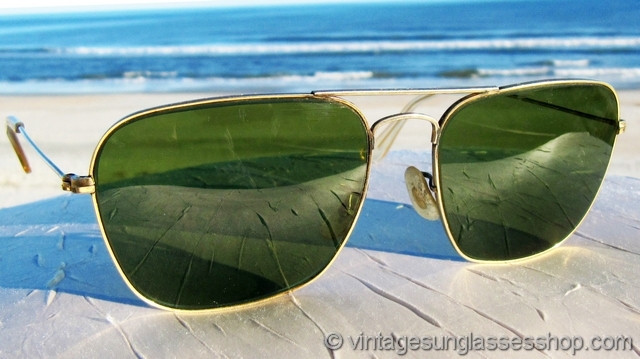 3 For a rare and early G-15 Caravan that also gives you the most secure fit, you'll enjoy the very small production B&L Ray-Ban 10k gold overlay Caravan shooters. 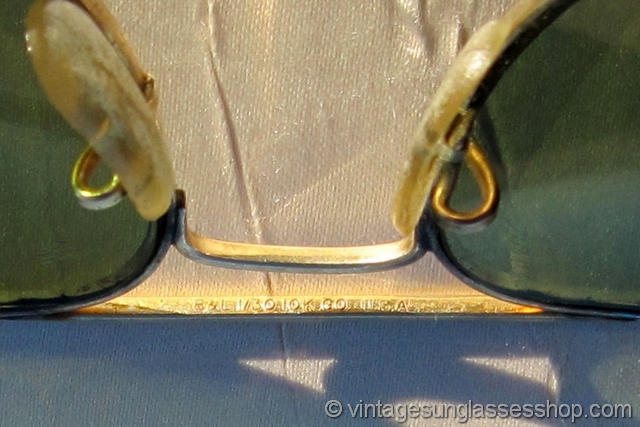 These rare 10k GO Caravan shooters are identical in size and appearance to those below except that "shooter" ear stems that curve around the ear are substituted for the traditional paddle ear stems. 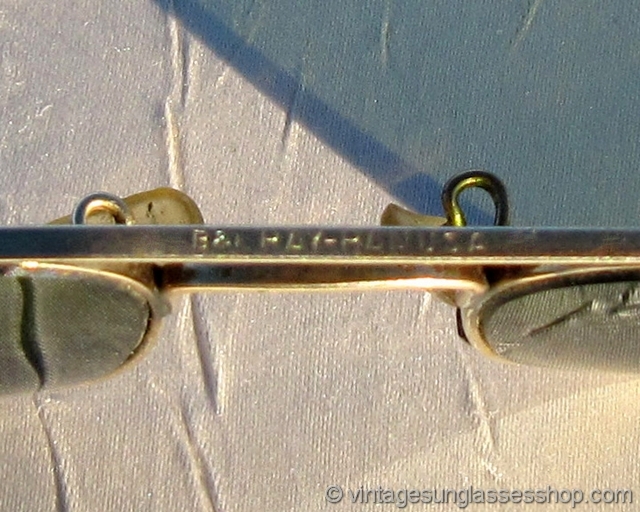 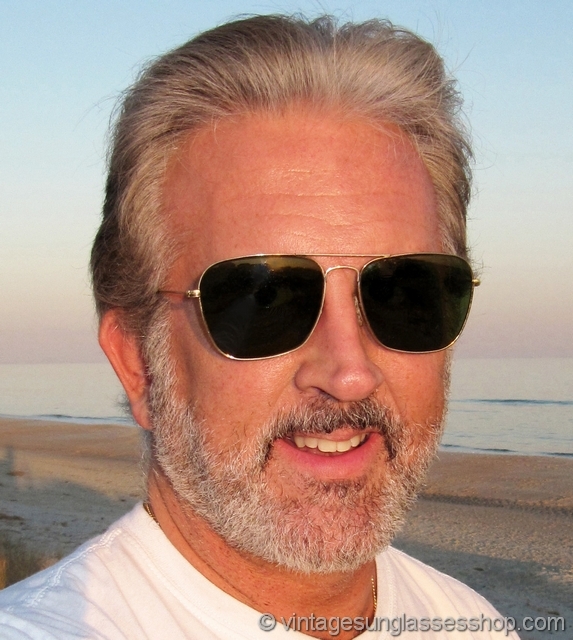 These 10k gold filled B&L Ray-Ban Caravan sunglasses are impressed on top of the nose bridge B&L 1/30 10k GO USA (GO = Gold Overlay and preceeded the use of GF) while the bottom of the bridge is impressed B&L Ray-Ban USA. 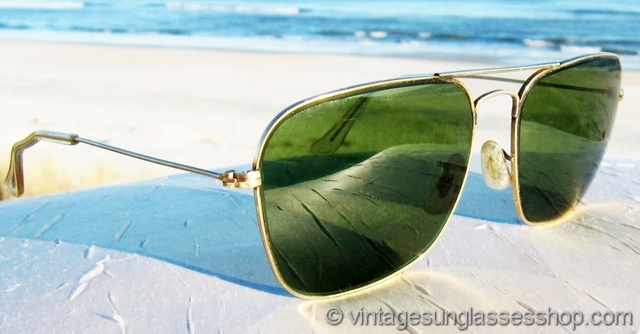 See our entire selection of vintage Ray-Ban Caravan sunglasses, and thanks for visiting and shopping at the Vintage Sunglasses Shop!